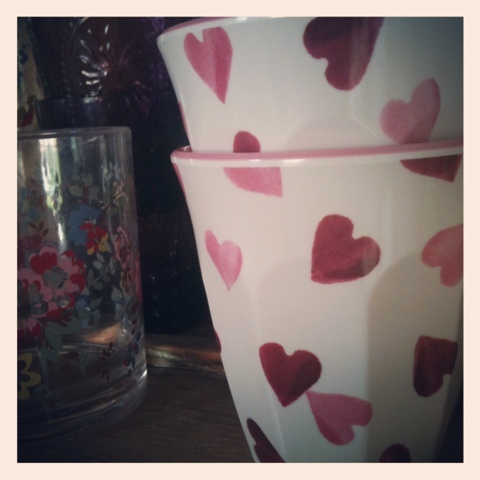 Pieces of wonderful: A jar full of love..
A jar full of love..
Oh hello, how are you? 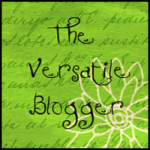 It's been a while, sorry about that readers. I have no excuse really, life just got in the way and somewhere along the line I went from Olympic cynic to Olympic addict and I seem to spend all my time glued to the tv. It's all good fun isn't it. So what's new? you ask. Well firstly, I have to tell you about the goodies that I received in the post. I recently took part in my first official group craft swap and I was paired with the lovely Faye from Cartwheels and bubbles (who incidently is the sweetest person). I was very very excited to send and receive the jars and let me tell you, the wait was well worth it. Faye put such care and effort into her jar that opening it was a real treat. 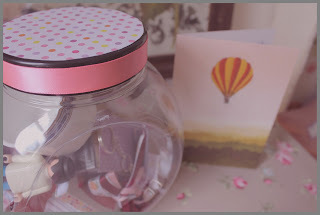 She recently wrote the sweetest post about the jar I made for her so please have a look if you want to see what I sent..
My cookie jar full of treats and lovely card. Lovely detailing on the jar lid. One of my favourite items, three little spools of tape. A selection of lovely trinkets. There was much more in my jar for me to fuss over, I loved everything but these were my favourites of the bunch. As if this lot wasn't enough, there was also an extra something that Faye included. While emailing each other, I was very happy to find out that Faye currently lives in Cheltenham. I lived in Cheltenham for five wonderful years, probably the best five years of my life so far. I told Faye this and that I used to work in Cheltenham Library..and this is what I found in my jar parcel..
A book from the Cheltenham Library sale shelves. Strangely. the labels are supposed to be taken off the books when they are withdrawn for sale but somehow this one escaped. The best thing about this thoughtful gift was that the book had only been stamped between the dates I was at the library so I probably stamped it, most likely shelved it a few times. It was a really thoughtful gift that touched me more than Faye probably expected it would because I can link it back to such a special time in my life. So I did very well out of this swap and I enjoyed it immensely. Funnily enough myself an Faye had had similar ideas and put similar things in our jars, most notably a single cookie cutter and some lip balm. The 'Jar of Love' swap was kindly arranged by Katie at booty-full things. Thank you Faye, thank you Katie. In between swapping jars and cheering very loudly for team GB (aren't we doing wonderfully well? I have never been so excited about sport) I also took a little trip to Bicester Village the day after pay day. I went there specifically to visit the Cath K outlet but found this treasure of a shop which was far more exciting.. 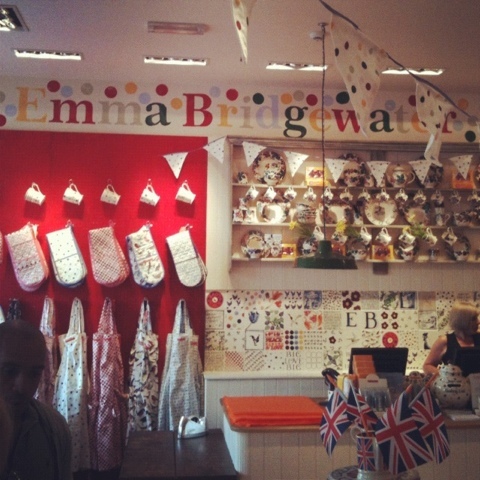 The Emma Bridgewater outlet is something special indeed. 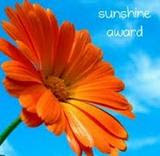 Bright and full of colour and wonder. There are treats wherever you look and some wonderful prices. Make sure you visit the shop if you're ever heading that way. It surpassed the Cath K shop by far..even though there were lovely Cath K dresses in the outlet and I was very tempted to buy them all. But I brought some EB Melamine instead. And despite being busy this week I still had time for some boot-sale fun. Despite getting caught in a monster rain storm that sent most of the sellers packing. 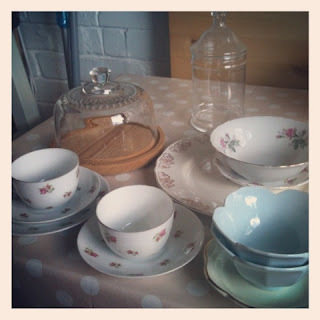 I stuck to it and managed to get a good look round and I picked up a whole lot more china. I even got the pleasure of rummaging through a trunk of old china that no one else had seen and found some beautiful rose bud china..my absolute favourite. A trip to my local charity shop lead me to this lovely cheese dome and glass jar. I plan to pair the cheese dome lid with my glass cake stand and the jar is now holding my cupcake cases because my old jar just wasn't cutting it! Phew. That's about it for me, it feels good to have caught you all up. Now tell me, what's new with you? how strange that my thought about the book was the date label!! Great minds eh Lexie?! I so could not wait fr the whole Olympics thing to be over, I was dreading it but you know what I'm actually loving it too but ssshhhh don't tell anyone. I actually went up to Stratford yesterday, as James had to pop into work. The atmosphere up there is incredibe, it's buzzing and although it's really busy, everyone is in such high spirits, it was great. Gosh! thats a wonderful jar of goodies ....and how very thoughtful of Faye sending you a book from the library you used to work at. I call that considerate! I must say I enjoyed this Jar of love swap...my very first too. I do hope Katie hosts another one in the future.